Light, airy, creamy and soooo delicious! This describes my baked vegan cheesecake the best. And btw. this isn’t a regular baked cheesecake since it also has a yummy poppy seed layer which makes it even more special. I tell you, this is a killer combo and if you haven’t tried it yet, you are missing out big time! Are you ready for this gluten-free, vegan, oil-free dessert? 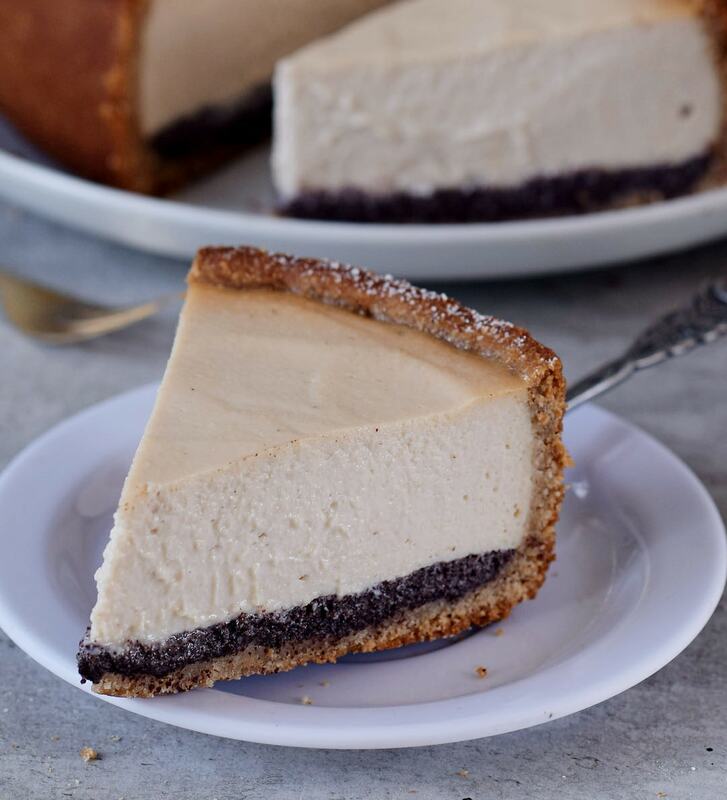 What makes this baked vegan cheesecake so creamy? Well, I didn’t add any animal products like cream cheese, sour cream, and eggs but I used silken tofu, coconut cream, and cashews instead. You can use vegan cream cheese if you can buy it in the store. I prefer to use as few processed ingredients as possible and this combo turned out pretty amazing. It’s creamy, light, airy and super delicious. 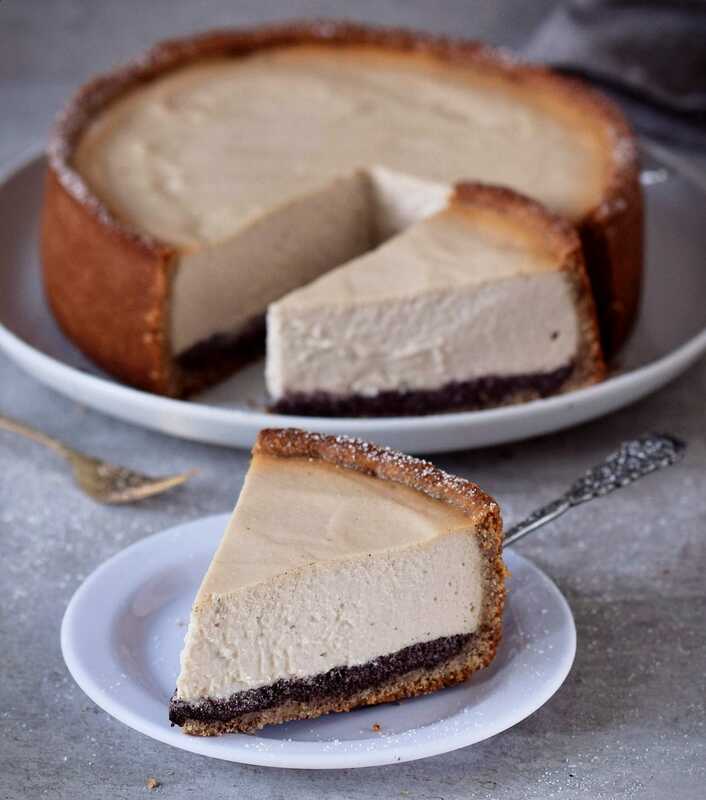 As mentioned before this baked vegan cheesecake is plant-based, gluten-free, refined sugar-free, oil-free and contains mainly unprocessed ingredients. If you are allergic to nuts, and therefore can’t use cashews, I would recommend increasing the amount of coconut cream by half a cup. Or, you could add 1/4 cup coconut yogurt plus 1/4 cup of melted margarine (or vegan butter). The poppy seed layer is optional, you can also leave it out. However, if you love poppy seeds as much as I do, then definitely add this yummy layer! Cakes with poppy seeds (and I mean lots of poppy seeds) are probably not very common in the US and many other countries. Poppy seed cakes are very popular in the Czech Republic and in Poland though. My parents are from the Czech Republic and I grew up in Germany where poppy seed cakes are also very popular, which means I ate lots and lots of poppy seed desserts, haha. Let me know in the comments if you are a fan of poppy seed cakes/pastry and I would love to know where you are from. 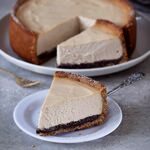 This baked vegan cheesecake with a delicious poppy seed layer is a wonderful light/airy cake and perfect for warm summer days. Also great for a birthday party. The cake is vegan, gluten-free, oil-free, refined sugar-free and easy to make. Soak cashews in hot water for at least 1 hour (if you are in a hurry, you could also boil them for 15 minutes). To make the crust, put the shredded unsweetened coconut into an electric spice/coffee grinder (or food processor) and blend. Repeat this step with the oats. Transfer all crust ingredients into a food processor and mix until the dough is crumbly and sticks together. It should have the texture of shortcut pastry. Press the crust evenly into the bottom of a lined 8-inch (20 cm) springform and about 2 1/2 in (6 1/2 cm) up the sides and put the springform in your freezer. To make the poppy seed layer, put the poppy seeds into an electric spice/coffee grinder and mix. Now add all ingredients to a saucepan and bring the mixture to a boil. Once it thickened up, you can turn off the heat and set the saucepan aside. Let cool for a few minutes and then pour the mixture into the springform onto the crust. Put it back into the freezer. For the cheesecake layer: Blend all cream ingredients in a high-speed blender (or food processor) until smooth and creamy. Pour the cheesecake cream onto the poppy seed layer. Bake in the oven for about 60-70 minutes at 350 degrees F (175 degrees C). Turn off the oven and let the cake cool at room temperature until it isn't hot anymore. Don't touch it, the middle of the cake will still appear wobbly, but that's normal. Once the cake has cooled slightly, put it in the freezer for about one hour (or in the fridge for a couple of hours) to set. It will firm up and can be sliced. Store leftovers in the fridge. Enjoy! What if you’re allergic to soy? Can I substitute the tofu with more cashews? Thanks! Hi Angelika, well, you would need a lot of cashews to substitute 700 g of silken tofu. Not sure where you are based, maybe you can buy vegan cream cheese in the store which doesn’t contain soy? Or try a combo of coconut yogurt and cashews, that should work (I never tried it out though). Hope this helps. 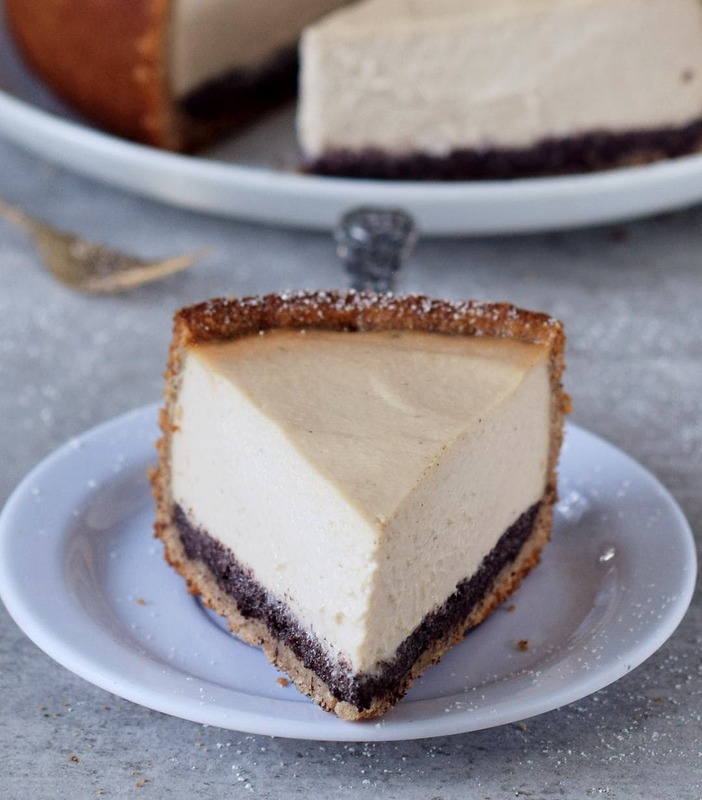 That looks delicious, I have high cholesterol so try not to use coconut, much as I love it, could I use dates in the crust and almond or soy milk in with the sesame seeds ? Hi Christine, I never heard that coconut will have a bad effect on cholesterol (LDL). I eat A LOT of coconut products (every single day) and my cholesterol is around 150. Instead of shredded unsweetened coconut, you can use ground almonds (almond flour) or any other ground nuts/seeds in the crust. And yes date paste in the crust should be fine. In the poppy seed layer, you can use almond or soy milk. In the cream cheese layer, I would recommend soy yogurt and a little bit melted vegan butter/margarine. This recipe looks fantastic! Such clean ingredients… cannot wait to try it out. I love cheese cake so much! And this one looks so good to me! I should definitely try your recipe ???? Thank you so much, Nadia. Yes, it’s super fluffy and cream indeed. ???? hey Ela! what a yummy beautiful cheesecake! I could eat cheesecake every day hehe. 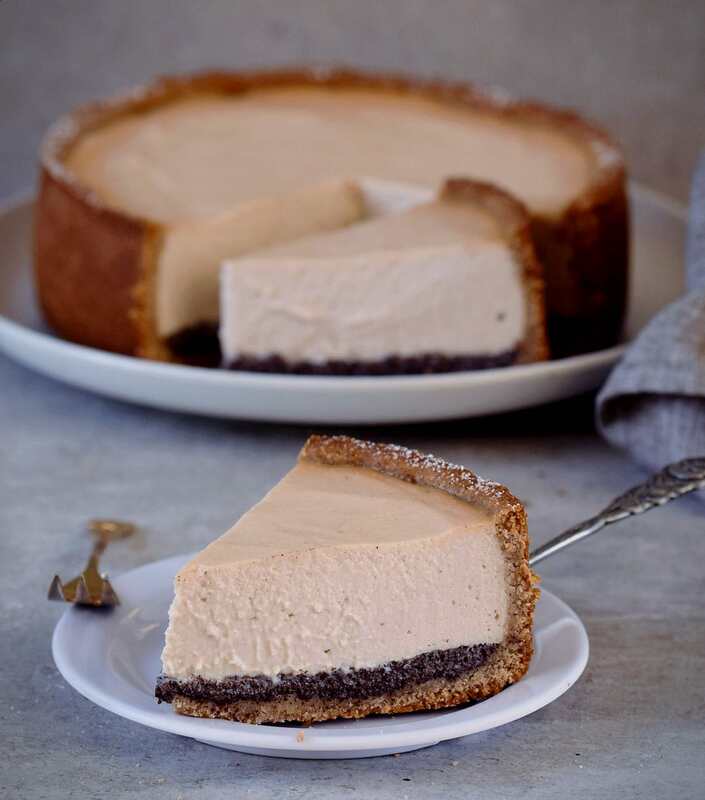 The recipe is amazing <3 I also love to use cashews in my cheesecake, they give a lovely firm creaminess which is difficult to achieve otherwise. Also the poppy seed layer is so lovely! I haven't baked with poppy seeds, they're not common here in Finland. But whenever I visit my sister in Munich, I eat bread with poppy seed on top. Love it 🙂 Enjoy the new week! I looooove poppy seeds❤ in Austria it’s also very common, you get a lot of sweet treats with poppy seeds but your version of cheesecake with them I have never seen before so I will definitly try this, thank you for sharing???? This is such an exquisite cake, Ela! 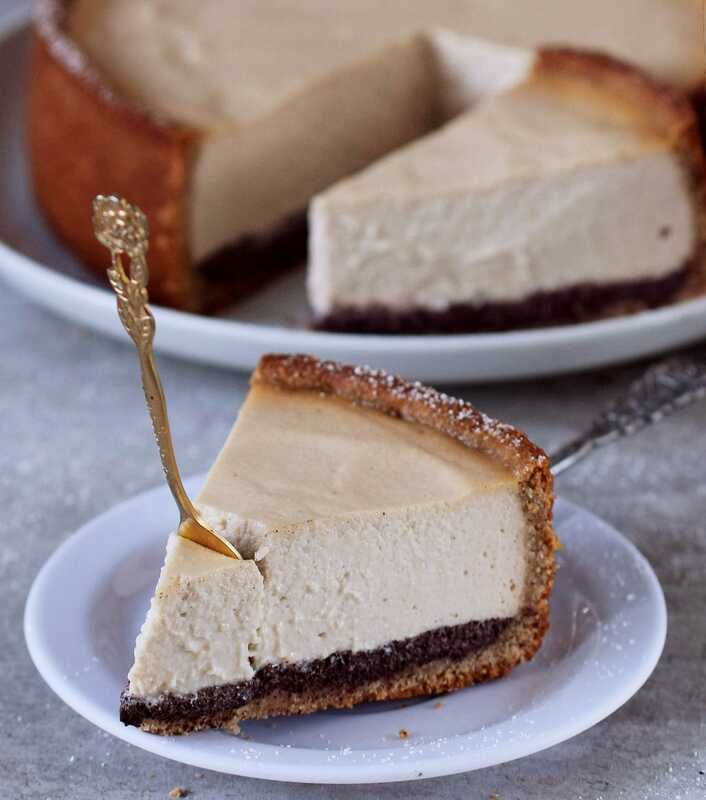 I love that you baked it since most vegan cheesecakes are raw. I love that thick and luscious texture! I made this yesterday for friends, it was amazing! I’m loving your website and recipes! – I have a super small fridge with an even samller freezer. That freeze hour with the poppy seeds layer would be necessary even if I make it with a normal base of cookies and butter? – I don’t have an electric spices/coffee grinder… just a small processor… would it work also? Or better to smash the PS with a mortar? Hope I can do it despite this lacking. And i will try Your vegan version soon also! 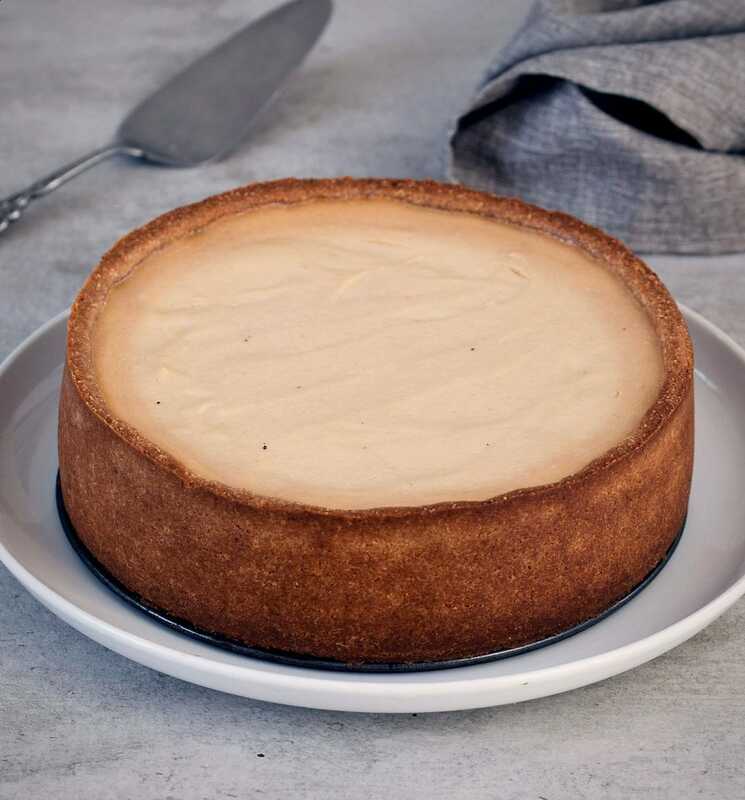 Can you make this recipe into 12 mini cheesecakes?? What can be substituted for all the coconut? I cannot eat it. 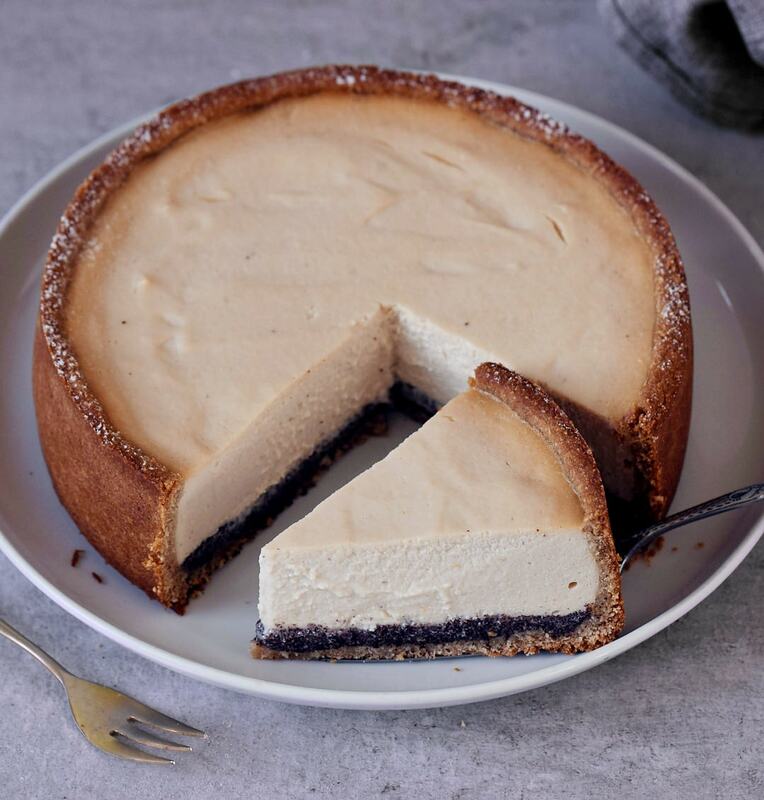 I really want to try this recipe but I am wondering: do you put it in a water bath like you would with regular cheesecake or do you just bake it? I feel kinda confused at this part. I`m very excited to try this recipe! Tell me please, how can I substitute 2 cups of oats in the crust? Just one question! How would I know it is done?? Even I do same temperature and time, it differes from the oveb right? Since u said middle part can be still wobbly when it is still hot, can use a toothpick toncheck it?? Hello, I want to do this for guests who don’t like desserts that are too sweet. So this is why I have chosen a cheesecake. But I have one guest who doesnt like the taste of coconut. Does it taste a lot? Thanks! I loved the texture of the “cheesecake” and the crust…..I missed the “cheesecakey” flavor….Mine came out a bit bland. I followed the recipe – and used the agave versus maple syrup.